Like all martial arts karate is based on the philosophy of Zen Buddhism. "Kara," "the void" points in addition to the fight unarmed in a figurative sense, the attitude towards and that is to be taken during the training. Because the goal is the karate-practicing, in addition to learning precise techniques and physical exercise, especially the training of the mind. These two aspects of the technical and intellectual perfection can not be separately considered the philosophy of martial arts. In Japanese, there is therefor the expression "Shingi Ichinyo", the "unity of art and spirit." In practice, this means that the spirit of the art training by the training, the technique is perfected again by the Spirit, however. 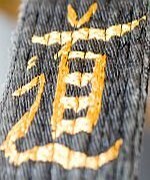 The karate-practicing is this view as a path of continuous personal development of mind and technology conceived from. This spiritual-philosophical point of view of Karate is known therefore as "Karate", the "Way of Karate".